There’s plenty of sunshine on offer at Terre Blanche – 300 days on average to be precise. It’s also a delightful place, situated in a hidden corner of Provence on the edge of the beautiful Côte d’Azur. The grand plan was to create an Eldorado for golfers and, with help from the Four Seasons Group and architect Dave Thomas, the fabled 6,616-metre Le Château course opened with rapturous applause in 2000. Actually, two courses have been fashioned here and both are the creations of Dave Thomas. The Château and Le Riou are both gorgeous courses, immaculately maintained and pretty spectacular but the Riou will have to wait its turn because the Château is the one that everyone is talking about. Dave Thomas has slipped the Château course onto the landscape like a hand sliding into a silk glove. Thomas has transformed the wild and hilly landscape into a golfing heaven with a layout that will test the very best golfers. Terre Blanche Hotel Spa & Golf Resort is bound to attract many wealthy visiting golfers and quite rightly so, this fabulous new golf resort is probably one of the best in France. Excellent course and great facilities with the adjacent Hotel and its villas. Perfect for a nice golf freak in southern France. The Chateau course is a really fantastic layout with some really nice looking holes, like hole 11 with its canyon down the fairway. Some really veautiful views of the provencal landscape. Unfortunately the location is far from the local airports in Cannes or Nice. But if you are there by car it is for sure a must play destination . The greens had been aerated and sanded so the course was not at its best but having said that the greens were playable. Clearly a very good course with length to test better players. 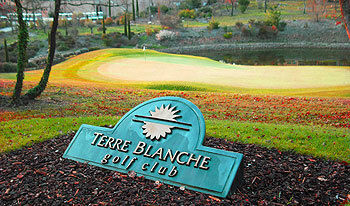 The course is a combination of provençal and parkland. Water features on several holes. The par 5 14th is a hole that would benefit from a second look to better appreciate the tee shot. The hole is a dogleg to the right with bunkering and fairway at the dogleg that is unclear from the tee. Most holes however are laid out in front of you with no hidden surprises. The course has elevation and descent but is much flatter than the sister course 'rioul'. The course deserves its rating but I found the rioul more enchanting. The Chateau course was the highlight on a recent golf trip to the South of France. The whole Terre Blanche Four Seasons experience is saved for the very well off or the very lucky, I am in the latter group - everything at the resort is 5-star throughout and that includes the golf. A friendly opening hole; a par-5 from an elevated tee is nice to get you started but there is evidence already that you are walking a top-notch course. The 3rd hole is a par-4 around 440 yards turning left to a great green-site, with a beautiful Canadian feel to it. Water is in play at the next few holes with the par-5 6th being a very special hole; behind the green high into the trees you will see Le Chateau, which is the name of the hole as well as the course. Hole 10 is another memorable par-4; keep left off the tee with touch of fade and you are set-up to play over the lake. The tee at the 11th is another that is elevated above the fairway, inviting a big tee shot on this par-5, then a very cleverly placed stream and bunkers to the right at landing point on your second are bound to catch most shots. The shortest par-3 is at the 16th, about 160 yards maximum but all carry as the dry stone wall in front of the green is protecting. To give you an idea of how the course looks and feels, just think of the Stadium course at PGA Catalunya, Spain – some may say Le Chateau is as good… Last thing to mention and again a great comparison the PGA Catalunya, there also is a quality second course here, Le Riou (members and residents only) if you get a chance to play it, I recommend that you do…. Yes, Terre Blanche. is expensive. Don't expect anything else. We paid 175 Euros a man - including the obligatory cart. That cart did rather stick in the throat. Not because of the cost but because they insist it is taken for reasons of pace of play. 5 hours later, much of it spent sitting in the cart, it is hard to imagine it really speeded things up. Once we got through that annoynace the course really is hard to fault - it is pretty close to perfect. The condition is amazing, the holes are interesting and varied and the service impeccable. As a golfing experience it beats the socks off everything in the area, probably Taulane is the only one which runs it close. This is very much a resort course and you will never think you are part of a club. It is hard to get any feeling of passion for the game here or any history (no matter how hort). But it is a Four Seasons resort so everything is done tremendously well. If you can afford to slurge the cash then you will not be disappointed. A good resort, certainly 5* with 5* prices! The courses are in excellent condition as you would expect. The course design leaves me empty though, each hole you play you just feel like you're waiting for one decent hole, unfortunately it never really comes. This really is a stunning golf course. Often, an over-priced resort course can be a massive let down. At Terre Blanche, the whole experience from start to finish was exceptional. The quality of the service was second to none, there was no waiting anywhere on the course, and the course condition itself was faultless. If you have a few quid to spend on holiday, spend it here. If I had to pick out favourite holes (and there are many, many good ones), they would be the 3rd (in particular) and the 11th. It`s true it`s not cheap, but it is worth every cent. a great golf course in perfect condition. it`s so much fun to play there. Wonderful course, with it's affiliation with the Four Seasons it oozes class and money. We enjoyed this course so much, we went back and played it the following day. Little things like free range balls, and people that gladly load your bag and clean your clubs add to the special touches at this place. The course is beautifully set out, with tree lined pristine fairways, and tricky quick paced greens. The limited amount of play gaurentees top conditions, and I will be very surprised if it is not shooting up the rankings soon. Makes places like Hardelot (ranked above it) look like a Municipal. The other course looked amazing as well, but was reserved for members and guests of the Hotel. Unfortunately the cost to stay requires some serious cash, but worth doing for those flush enough.